Scotland's first minister has outlined her next steps in attempting to secure Scotland's position in Europe, a month on from the Brexit vote. In a speech in Edinburgh, Nicola Sturgeon set out key interests she believes must be protected. She has previously said a second independence vote was "highly likely" but promised to explore other options. The Scottish Conservatives said another "divisive" referendum was not in Scotland's best interests. Scottish voters backed remaining in the EU by a margin of 62% to 38% in June's referendum while the UK as a whole voted by 52% to 48% to leave. 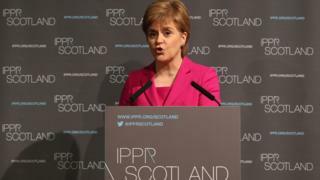 In the speech to business leaders, charities and public sector organisations for think tank IPPR Scotland, Ms Sturgeon listed the five key interests she will seek to protect during the coming months' negotiations. Democratic interests - "the need to make sure Scotland's voice is heard and our wishes respected." Economic interests - "safeguarding free movement of labour, access to a single market of 500 million people and the funding that our farmers and universities depend on". Social protection - "ensuring the continued protection of workers' and wider human rights". Solidarity - "the ability of independent nations to come together for the common good of all our citizens, to tackle crime and terrorism and deal with global challenges like climate change". Having influence - "making sure that we don't just have to abide by the rules of the single market but also have a say in shaping them." Ms Sturgeon spoke of the "sinking feeling" she had as the EU referendum result started to come in. She said she felt "contempt" for the Leave campaign, which she said "lied" and "gave succour" to "overt racism" and the far right. And she hit out at former Prime Minister David Cameron for the "reckless" decision to call the vote, as well as the lack of planning for the eventuality of a Brexit vote, calling this "one of the most shameful abdications of responsibility in modern political history". Ms Sturgeon and Mr Cameron's successor Theresa May held a meeting in Edinburgh earlier this month, after which Mrs May said she was "willing to listen to options" on Scotland's future relationship with the EU. But Mrs May appeared unwilling to consider a second referendum on Scottish independence, saying the Scottish people "had their vote" in 2014. Ms Sturgeon also discussed the implications of the Brexit vote at last week's British-Irish Council summit. In her speech, Ms Sturgeon restated her willingness to consider all options - but said it was in the UK government's interest to help find a solution short of a second independence poll. She said: "We can seek to find - or create - a solution that enables Scotland's distinctive voice to be heard and our interests to be protected within the UK. Or we can consider again the option of independence. "I don't underestimate the challenge of finding such a solution. "Now is the time to do more than just assert - against the evidence to the contrary - that the union works for Scotland - it is surely time now to find ways to demonstrate that Scotland's voice can be heard, our wishes accommodated and our interests protected within the UK. "It seems to me that the UK government now has a responsibility - indeed a vested interest - to do so." Scottish Conservative finance spokesman Murdo Fraser said Ms Sturgeon would inevitably conclude that a second referendum was the only option, saying "nationalists would never reach any other conclusion". He added: "Nicola Sturgeon talks about five tests - but the truth is there's only ever one test for the SNP, and that's separation. She is setting these up to fail to provide another flimsy excuse for a referendum re-run. "Scotland does not want to go through the division and upheaval of another independence vote. Instead, the Scottish Government should be working hard to make the best of this, not shoehorning its narrow agenda into almost anything it can." 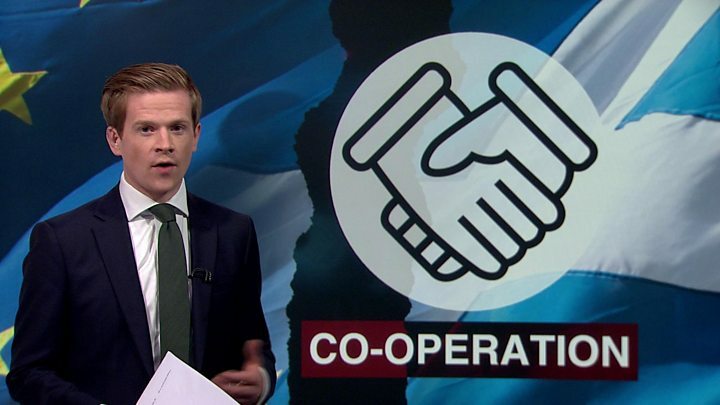 Scottish Labour's Europe spokesman Lewis Macdonald added: "It is essential that the leaders of all the devolved administrations and the UK government work together in advance of any negotiations with the EU. All sides must put posturing to one side for the sake of the country and act in good faith. "Any of our leaders deliberately placing obstacles in the way of an agreement that maintains our vital relationships with the rest of Britain and the rest of Europe would run counter to the express wishes of the people of Scotland." Mike Rumbles of the Scottish Liberal Democrats welcomed the fact that talks were continuing with the UK government and EU officials, but warned the first minister to ensure these were not "set up to fail". He added: "I do not expect the first minister to stop supporting independence, but I do expect her to honour her commitment to work with others in good faith. "She will have my support if she does so, but focusing on independence would risk breaking the consensus that emerged following the Brexit vote."